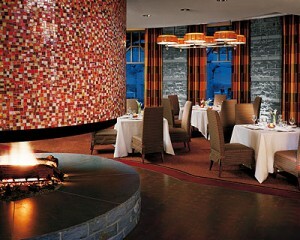 Visiting the Four Seasons Whistler’s Fifty Two 80 Bistro as we did in October requires a bit of imagination. Whistler is, after all, a skiing town and the white stuff isn’t truly in its element for a few more months. We therefore had to imagine throngs of people clad in snowflake patterned sweaters layered over thermal underwear turtleneck tops sipping beverages après ski by the fireplace in the large lounge at the restaurant’s entrance. Of course, our reverie could just as easily place gentlemen in classy suits and ladies in little black dresses sipping cocktails amidst this lounge’s luxurious leather furnishings and tasteful décor. Though described as a casual restaurant, the décor and menu will not disappoint those in the mood for slightly a “finer” experience. The décor of the main dining room is fresh, modern and inviting. Warm, earthy, and peachy tones are complemented by wood accents that reflect the glow of the open stone fireplace. (There is also a fireplace outdoors for al fresco dining in the summer months.) Everything at the Four Seasons Whistler, including the Fifty Two 80 Bistro (named, incidentally after the 5280 foot elevation of Whistler’s famous Blackcomb Mountain), is attractive and in impeccable shape at this relatively new hotel. Fifty Two 80’s a-little-bit edgy menu is seafood-inspired, with daily creations served up from the bounty of the Pacific Ocean. We were urged to begin with a taste from the “live-action seafood bar” featuring prawns, freshly shucked oysters, lobster and other tasty bites. We sampled crab and lobster “raw shots” – amazingly tender morsels of these tender shellfish were actually served in a shot glass on a tiny bed of frisée lettuce. These tasty teasers are also served with homemade specialty sauces – I definitely recommend the tantalizing, fresh, green goddess sauce. Seafood is king at Fifty Two 80. Sure, the daily changing menu serves up share of chicken, prime rib(and even turkey with stuffing on the Canadian Thanksgiving holiday which occured while we were there), but restaurant specialties here revolve around things with gills or some mode of breathing under water. We visited the Bistro twice during our stay at the Four Seasons and sampled several items from the menu. Between those two visits, for first-courses (following seafood “raw shots”), we enjoyed a Golden Beet Salad with lightly breaded, warmed goat cheese and a tarragon dressing, House Smoked Wild Salmon on potato blinis with dill cream, and steamed mussels accompanied by frites and a spicy mayonnaise dip. Seafood reigned for our main courses. Generously sized garlicky prawns with a refreshing tomato salsa served with a mixed green salad was one evening’s choice – and then the highly recommended Black Cod with sweet corn and chanterelles. Desserts were rich and indulgent, such as the simply and aptly named “Chocolate” – a medley of chocolaty treats such as a Bailey’s and chocolate fudge morsel and sour cream and chocolate chunk ice cream. We found the wine list to be rather small and quite focused upon British Columbia wines. It provided an interesting rather than stellar selection. We had the Cedar Creek Platinum Reserve Chardonnay, 2002 on the first night, which was notable for its light, non-oaky taste. The next night, being in an eclectic and celebratory mood, we began with Sumac Ridge Brut from the Okanogan Valley – not exactly a creamy Champagne, but a still a nice beginning to a meal. We then took advantage of the half bottle offerings and had both the Blue Mountain Chardonnay 2001 and the Cedar Creek Estate 2002 – the second better than the first. Service was quite good – very friendly, and servers had good knowledge of the menu. As for dress code, think presentable (change out of your ski gear), but not overly formal. We give Fifty Two 80 4 Stars – Excellent!